This third parish pilgrimage, and second ecumenical pilgrimage jointly sponsored by our parish and Advent Evangelical Lutheran Church, took 81 pilgrims to Germany and Austria and see the Passion Play in Oberammergau, from June 27 through July 7, 2000. Arrangements were made through Travel Two Thousand Corp., Oak Brook, IL, and Pleasure Break Vacations, a Division of the Mark Travel Corporation. Our parish secretary, Jeanne Flowers, although unable to participate in the pilgrimage, served as the coordinator and communications hub for pilgrimage planning, for which all the pilgrims were extremely grateful. 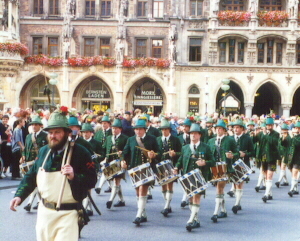 Part of the procession from Marienplatz, Munich, to the Church of St. Peter; a pontifical Mass celebrated the Feast of Sts. Peter & Paul and the grand re-opening of the church after renovations. The Fathers McLaughlin concelebrate at the Church of St. Ulrich and St. Afra in Augsburg, Germany. The Chalice and Pectoral Cross of St. Ulrich are over 1,000 years old. 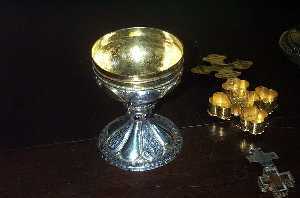 The small wooden cross was presented to Bishop Ulrich by the Pope, and contains wood from the True Cross; it is kept as a relic encased in silver and gold decorative crosses. The pilgrims left the parish parking lot for Philadelphia International Airport on Tuesday, June 27, at 2 P.M., assigned to "Bus A" or "Bus B": these buses eventually took different paths in Europe and  according to some  developed different personalities. Flying via Lufthansa, the group changed planes in Frankfurt, Germany, and arrived in Munich around 11 A.M. Wednesday. Upon arrival at Munich airport, the pilgrims boarded their assigned buses for an orientation tour of the city. The tour left the group in Marienplatz, the square from which all distances in Bavaria are measured, with free time to exchange money and eat lunch. Around 3:30 P.M. the group settled into the Hotel Seibel. Dinner was at 7 P.M. in the Hofbräuhaus, featuring the traditional wurst and sauerkraut. Thursday provided time for individual sightseeing. One group took an all-day tour to Rothenburg, the best-preserved medieval city in Europe. Father McLaughlin and some of the pilgrims attempted to join another "American Group" at an 11 A.M. Mass in St. Paul's Church, near the hotel, but that group experienced transportation problems and never arrived. 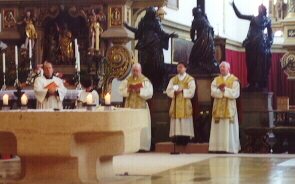 Later in the day Father McLaughlin's brother, "Father Bob," and some others chanced upon a solemn procession and Mass celebrated by the Cardinal Archbishop of Munich at St. Peter's Church, Munich's oldest church (1180)  the Mass celebrated the Feast of Sts. Peter and Paul and the grand reopening of the Church after two years of restoration. Following breakfast on Friday, all the pilgrims boarded their buses for a day in Augsburg, including a guided tour of the city and free time for lunch and individual sightseeing. All gathered in the Church of St. Ulrich & St. Afra for the 6:30 P.M. Mass which the Fathers McLaughlin concelebrated. The celebrant welcomed our pilgrims in German and in English, and parishioners extended their welcome after Mass. Martin Luther's Augsburg Confession marked his definitive break with the Catholic Church, but the 1555 Peace of Augsburg equally recognized Catholics and Lutherans in the city. That peace continues with both Catholic and Lutheran Churches in the St. Ulrich & St. Afra complex. St. Afra died as a martyr in 304 A.D., during the persecution by the Roman Emporer Diocletian; she was buried in the Roman cemetery south of Augsburg, and her grave became a place of pilgrimage and the site of a church. Most of the bishops of Augsburg were buried in this church, including Saint Ulrich who died in 993 A.D. In 1012 a Benedictine Monastery was founded at the site. The present Church is about 500 years old; the vestments worn at our Mass are 200 years old. After Mass in the sacristy, our priests were shown St. Ulrich's chalice and pectoral cross which are 1,000 years old. On Saturday, July 1, some of the group took an all-day tour of Linderhof, Innsbruck and the Swarovski Crystal World. The McLaughlin brothers concelebrated the 7 P.M. Mass at St. Paul's Church, where they and the pilgrims were welcomed warmly by the pastor and the parishioners. The interior of this magnificent stone church still shows some of the effects of its history: it suffered heavy damage in the 1944 allied bombing; an airplane crashed into a steeple in 1961  30 University of Maryland students were killed in the crash; and during the 1990's three bombs were set off in the church by Serb extremists, apparently because the parish hosts a weekly Croatian Mass. The modern Passion Play Theater, Passionspielhaus, accommodates 4,700 spectators. The spectators are covered; the stage is not. The Roman Catholic Church of Sts. 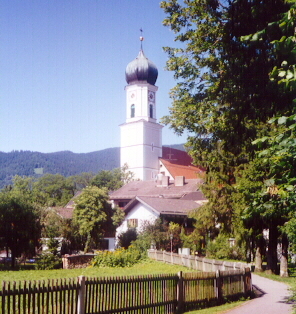 Peter & Paul, Oberammergau. On Sunday morning the Lutheran pilgrims attended St. Matthaus Church in Munich; they were warmly welcomed at the service and for fellowship afterwards. Others took a morning excursion to Dachau. Early in the afternoon the two buses transferred the group to Oberammergau. There taxis took them to a variety of lodging places in the area. Following check-in and dinner, some pilgrims were able to attend an ecumenical introduction to the Passion Play at 8:30 P.M. in the Catholic Church's Parish Hall. Monday, July 3, the pilgrims saw the Passion Play. A reflection on that experience will follow, but some comments on the weather may explain the spirit in which the villagers present the play. Up to this point the weather was beautiful, but there was a severe thunderstorm and heavy downpour in the wee hours of Monday morning. This was a concern because, although the 4,700 spectators sit under cover, the stage is outside and exposed to the elements, and the show is presented "rain or shine." Several of our group, speaking to villagers who were to perform in the show, promised prayers for good weather during the show. One of the children responded that they pray backstage before every performance, asking God to help the cast and support personnel in their efforts to bring his Word to others, to bless those who will see the show and allow their lives to be changed by it, and, finally, for good weather. The overnight rain had stopped in time for the pilgrims to make their way to the Passion Play Theatre where the spectators are covered but the stage is open to the skies. An 8:15 A.M. Ecumenical Morning Prayer Service at the Evangelical-Lutheran Church near the Passion Play Theatre was led by an Anglican priest (in English) and a Lutheran minister (in German); they challenged us to put ourselves in the place of the disciples, the Sanhedrin, the populace of Jerusalem, the Romans, etc.  how would we have acted, or not acted? The Passion Plan began at 9:30 A.M. The performance is in German; a book with the text in German/English or French/Spanish is provided to each person before the performance. The prolog begins: "Welcome to all who are united in the love of our God! Recalling his mercy, he sent his beloved Son, that he might fill the human soul with the Spirit of Heaven, to heal the lost world  so that the down-trodden might arise and withered branches bloom." The play begins with Jesus' entry into Jerusalem on Palm Sunday, and continues until Holy Thursday before the break at 12:15 P.M. The spectators are assigned to specific restaurants or inns for their lunch until 3 P.M. when the Passion Play resumes. During this lunch break the town experienced another downpour, but it cleared by 3 P.M. However, as the crucifixion scene began, the skies began to darken. A drum-roll from the orchestra pit followed Jesus' words: "Father, into your hands I commend my spirit." Then a courier came on stage to inform the High Priest that the curtain of the temple was torn in two. At that point, lightning flashed across the skies and it began to rain on stage. The rain ceased in time for the resurrection scene. The play ended around 6:15 P.M. All of our pilgrims were moved by the play itself, and in awe of nature's part in this particular performance. At 6:30 P.M. the Fathers McLaughlin joined seven other priests for a concelebrated Mass in English at the Oberammergau Parish Church of Sts. Peter and Paul. The principal celebrant was a priest of the nearby Ettal Benedictine Monastery; two priests were with a group from the State of Maine, and the others with a group from Buffalo, NY. The Neuschwanstein Castle, near Füssen, Germany, on a rock ledge in the Bavarian Alps. View of Salzburg's Old Town from the roof of the Hotel Stein. 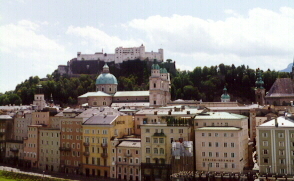 The dome and towers of the Cathedral are near the center of the picture; the Hohensalzburg Fortress overlooks the city. At the Frankfurt Airport, Father McLaughlin's mother, Loretta, poses with Tony Bennett who was also waiting for a plane. Following an early breakfast on Tuesday, July 4, vans took the pilgrims and their luggage from their various lodging places in Oberammergau to the two buses for the journey to Salzburg, Austria. 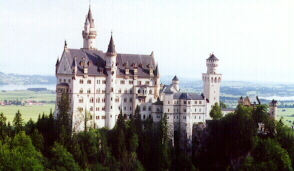 En route the group toured the Neuschwanstein Castle, near Füssen, Germany, begun by "Mad" King Ludwig II in 1869, and left unfinished after his 1886 death under mysterious circumstances. This the the most photographed castle in Germany (our photo was taken by Bob Rauchut). Following this castle visit, the buses headed south into Austria, across the Alps via Fern Pass, and onto the Autobahn through the Inn Valley, stopping for lunch in a delightful cafeteria and market at an Autobahn service area. The pilgrims arrived in Salzburg around 5:30 P.M. Unfortunately, the group was unable to stay together: the two buses went to different hotels. The group arrived at their hotels around 5:30 P.M., so most simply had dinner and settled in. More than half of the pilgrims had signed-up for a full-day tour of Vienna with a 6:30 A.M. departure time the next morning. Travel time between Salzburg and Vienna is around three and one-half hours one-way, leaving not enough time to explore fully the attractions of this city which is so rich in history and culture: churches, palaces, museums, concert halls, Opera House, etc. However, with the tour guides' explanations and some free time in the Old Town, most of those on the tour were happy either to have a once-in-a-lifetime experience or to get an overview in preparation for a future visit. On the return trip the group had dinner at the Melk Abbey, but arrived too late to tour the buildings. They arrived back in Salzburg at midnight. Thursday, July 6, provided all with an opportunity to visit Salzburg. The baroque Cathedral was consecrated in 1628, replacing a late-Romanesque structure completed in 1200, which replace the original 774 A.D. building. St. Peter's Church, part of a Benedictine Abbey founded by St. Rupert in 696 A.D., is richly adorned with art treasures. The Hohensalzburg Fortress was begun in 1077 and reached its present form in 1681; there is a magnificent view of the city and the nearby Alps from the fortress. (June McDermott can't believe she climbed to the very top!) Mozart's birthplace is in Salzburg, as are many other cultural, historical and religious sites. Optional tours on this day included the "Sound of Music" tour in the morning, and an afternoon trip to Berchtesgaden, from which participants visited either the Eagle's Nest or the Salt Mines. Many of the group spent their last night in Salzburg at a Mozart concert. Father McLaughlin visited St. John the Baptist Parish Church in Aigen, and concelebrated the evening Mass with the Pastor, Father Oberlascher. The parish's first church was built in 1411; a major expansion took place in 1689; and the most recent expansion in 1910. In the picture to the left, the tower and door facing the viewer are from the 1689 church; the 1910 church is perpendicular to the 1689 church and preserves its main altar as a side altar. Father Oberlascher is the only priest, and he also serves a nearby parish in Elsbethen; he is responsible for a total of 7,000 persons (our parish has approximately 6,000 persons). On Friday, July 7, very early in the morning, the journey home began. The two buses left their respective hotels for the several hour drive to the Munich airport. Following check-in, customs and passport control, the group boarded its flight for Frankfurt. In the Frankfurt airport there was not as much time as anticipated for shopping and currency conversion, but there was time to meet some other travelers. 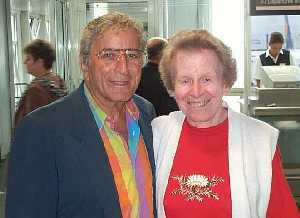 The picture on page 1 shows Mrs. McLaughlin posing with Tony Bennett. The theme for our pilgrimages has been the "living stones" by which the Church is built-up. And from each pilgrimage we have brought back stones to remind us of the living Churches we have visited. Vera Cawley gathered the stones for this pilgrimage, and they include: one from Oberammergau to remind us of the Passion Play which brought to life the first Holy Week, and the commitment the townspeople made to their 1633 vow in the face of the black plague  and another from Dachau to remind us of the evil of which human nature is capable without grace. During the Last Supper scene at the Passion Play, Jesus washes Peter's feet. In the year 1633. Oberammergau, a town of Bavaria in Germany, was in the grip of the black plague, and war had raged throughout the country for many years. The inhabitants wanted to do everything possible to keep disaster at bay in the future. They vowed to tell the story of the suffering and dying of Our Lord Jesus Christ to give us hope, and at the same time to admonish us: Live the way he lived! If you do that, you will do everything you can to eliminate all those conditions that bring disaster and death. They fulfilled their oath for the first time in 1634. For hundreds of years Oberammergau has kept its solemn promise. The cast is composed of amateur actors from the town and neighboring villages. The play shows the story of Christ's Passion, beginning with his entry into Jerusalem on Palm Sunday, and ending with the Resurrection and Ascension. The text of the Passion Play was adapted between 1850 and 1860 by Oberammergau's parish priest, Alois Daisenberger. The music was written in 1815 by an Oberammergau school teacher, Rochus Dedler, and employs a large choir and orchestra. For the year 2000 production, the text was revised to emphasize prophetic elements showing that Jesus, a Jew among Jews, wanted to fulfill the law and the prophets. Otto Huber and Christian Stückl The text and production were revised or newly designed as a "Play of Redemption" for the people of our times. 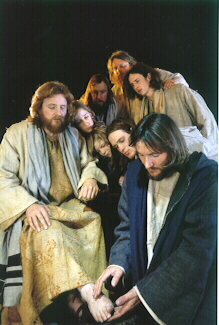 The Great Jubilee Year 2000 coincided with the 40th presentation of the Passion Play in Oberammergau. 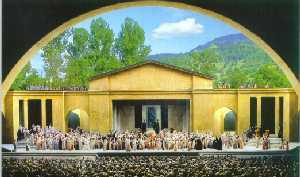 Some 2200 citizens of Oberammergau committed themselves as actors, singers, musicians, stage hands, etc. Performances were planned for five days a week from May 21st through October 8th. Spectators for the more than 100 performances are estimated at 500,000. The newly renovated theater, Passionspielhaus, accommodates 4,700 spectators.